In the bowl of an electric mixer, combine the shortening, sugar, eggs, and peppermint extract (OPTIONAL). Beat until light in color and fluffy (about 3 minutes). Mix in sugar, vanilla, peppermint extract (OPTIONAL), and melted chocolate. Add flour and salt and stir until incorporated. The batter will be thick. Remove 2 tablespoons of dough and mix with 2 drops of red coloring in a small bowl, until uniformly colored. To the remaining dough, add 4-5 drops of green food color and mix until the colors are uniform. Use an offset spatula or spoon to spread the green batter to evenly cover the brownie layer completely. Add three red dough hearts. To form the hearts, roll 2 teaspoons of red dough into a ball. Place the ball on top of the green blondie layer and use your fingertips to gently press the ball into a flat disc, then form a point at the bottom of the disc. Use a skewer or tooth pick to indent the circle at the top to create the top mounds of a heart shape. Lay a sheet of foil across the top of each pan (not touching batter). The foil keeps the colored dough from browning and keeps the colors vibrant. Bake for 15 minutes covered in a glass baking pan or 25 minutes in a metal baking pan. Then remove the foil and complete baking for another 12 minutes or until the top is set. The top may appear a bit moist, but will firm as the brownies cool. Store Grinch Brownies at room temperature in an airtight container or freezer weight ziplock bag for up to 2 weeks. Wrap individual brownies in plastic wrap. Place stacks of wrapped brownies in freezer weight ziplock bags. 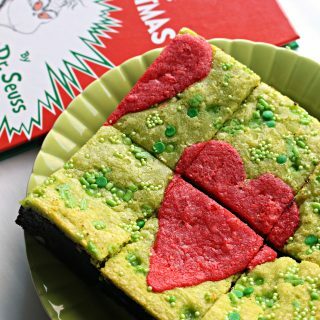 For long distance shipping, I recommend shipping Grinch Brownies uncut for longer freshness. Wrap the entire 8”x8” square of brownies (removed from pan using the foil overhang) first in foil and then in plastic wrap. Then insert the wrapped brownies into a freezer weight gallon ziplock bag or vacuum seal. Include a few plastic knives for cutting.